A dynamic website created with PHP may need to support email delivery. Most web hosting sites that provide PHP support will include configuration for emailing from a PHP script. There are PHP libraries that support advanced emailing functions, for example PHPMailer, but an easy way to check if mail support from PHP is working is to write a simple test script. 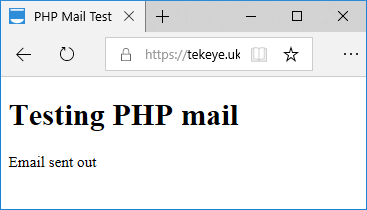 In this tutorial article a PHP mail script for testing email sending from your web server is provided. The PHP mail script provided here uses PHP's built in mail function. WARNING: Be careful when running scripts that generate email. Get it wrong and you will end up spamming out large amounts of email. Your website will slow down, the web server will slow down, the hosting provider will not be happy and could turn off your hosting, and you could be blacklisted as a source of spam. Ensure your emailing software works before deploying it to a live web server. However, reading the documentation on the mail function there are a few considerations. These are discussed as the script is developed. The script is a basic HTML page with some PHP code. It can be uploaded to your website and when the browser is pointed to the mail test page it'll generate a test email. The test page can then be deleted so that some idiot doesn't constantly run it. Now a message for the content of the email. Each line should be separated with a CRLF (\r\n). Lines should not be larger than 70 characters. There is also a warning in the PHP documentation about handling strings ending with full stops for Windows based PHP scripts that send email via SMTP. If that applies to your script see the PHP's mail function documentation. When sending mail, the mail must contain a From header. This can be set with the additional_headers parameter, or a default can be set in php.ini. Here is the full PHP mail script that can be added to a website server to test the email sending from PHP, remember to change the email addresses to your valid email. Upload the PHP email test script to your server and point the browser at it, e.g. http://www.example.com/php-mail.php (obviously use your server's address and the file name you gave your test script). The email should find its way to the inbox of the email address you set for $to. Remember that email is not instant messaging and can take from a few seconds to several minutes, or longer, to get to the inbox. Don't forget to delete the script once finished with the testing. Alternatively, if this test script is used as the basis of other email functionality, for example a comments or contact form, add anti-spam measures, such as reCAPTCHA. View the Tek Eye full Index for other articles. New to HTML, see a basic web page in Hello World in HTML. The easiest way to install PHP on Windows is with the Web Platform Installer. Need to know how to run PHP on Windows for development, see Developing PHP on Windows with Eclipse PDT.